The 2016-2017 competitive cheer season has begun. 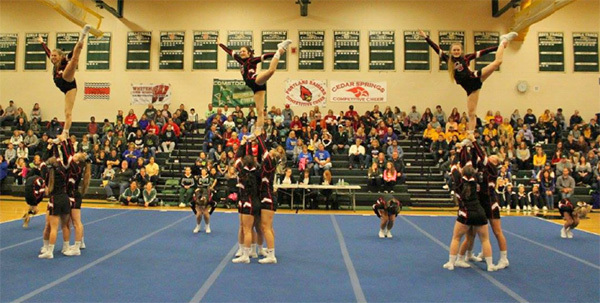 Cedar Springs Middle School, coached by Deb Garza and Abby Olszewski, took the mat for the first time December 1 at Coopersville Middle School and brought home their first conference win of the season. Saturday was the start to Cedar Springs high school JV and Varsity season. This brought the girls to Comstock Park High School for the CCCAM Scholarship Invitational, where there were 23 teams from 3 divisions competing. After the completion of Rounds 1 and 2, Cedar Springs JV, coached by Katy Hradsky, had a combined score of 243.34. Cedar Springs Varsity, coached by Anne Olszewski, had a combined score of 401.56. That brings us to Round 3 where the girls display their impressive stunting and tumbling skills. After the completion of Round 3, Cedar Springs JV earned a score of 226.08 bringing their total score to 470.14 and earning them a 2nd place finish for their division. Cedar Springs Varsity earned a score of 216.3 bringing their total to 617.56 and earning them a 3rd place finish for their division. Our next middle school competition will be Thursday, December 15 at Cedar Springs. The JV and Varsity teams’ next competition will be December 21 at Mona Shores. Come out and support a great group of coaches and cheerleaders as they show their pride in being a Red Hawk.